I love giving my hair a bit of lift at the roots. I think it makes all of the difference with my hairstyle. Lately, I am absolutely Obcessed with John Frieda's Luxurious Volume Blow Dry Lotion. I just aim it right at the roots before blowdrying and then I focus the dryer at the roots while pulling my round brush upwards. This menthod was recommended and taught to me by a previous hair stylist. I have been using this trick for years and am super happy with the results when I use this product! It gives me volume and lift that really lasts without stickiness! My hair is naturally thick. Like, very very thick. However, my hair has a soft slippery texture. So, despite its thickness, it does tend to just lay flat to my head. So, trying to coax volume with products is the key to giving my look some lift and pep. I like volume products that produce results while also leaving your hair touchable. I want to still be able to run my fingers through my hair without them getting stuck. The completely reinvented Luxurious Volume regimen begins building volume in the shower and continues to promote natural volume that lasts—no stiffness, no stickiness, no tradeoffs. The revamped regimen includes a new shampoo and conditioner and a breakthrough styling spray that supercharges the at-home blowout with salon-caliber softness, movement and fullness. • NEW Luxurious Volume Touchably Full Shampoo – This revolutionary shampoo not only detangles and removes residue that weighs hair down, but also employs hair-strengthening technology that targets damaged areas and fills them in, ultimately fortifying hair to give it lift and fullness. The shampoo is formulated with a proprietary spherical polymer that improves softness and begins building volume in the shower. • NEW Luxurious Volume Touchably Full Conditioner – This breakthrough conditioner leaves hair soft and silky without weighing it down, creating the ideal finish for boosting volume. A unique wax and silicone blend minimizes hair’s “slip” and gives it the texture to start building volume before you even step out of the shower. The formula weightlessly conditions to provide the perfect balance of moisture and texture for touchable lift and fullness. • NEW Luxurious Volume Fine To Full Blow-Out Spray – This unprecedented styling spray fosters a salon-quality blowout at home, creating natural looking and feeling volume that won’t fall flat and never feels stiff or crunchy. A patented polymer creates a flexible yet durable network of connections between hair that delivers soft, lasting fullness—meaning you can touch up your volume and run your fingers through your hair without getting them stuck. With the styling spray, there’s no tradeoff between long-lasting volume and touchably soft hair. 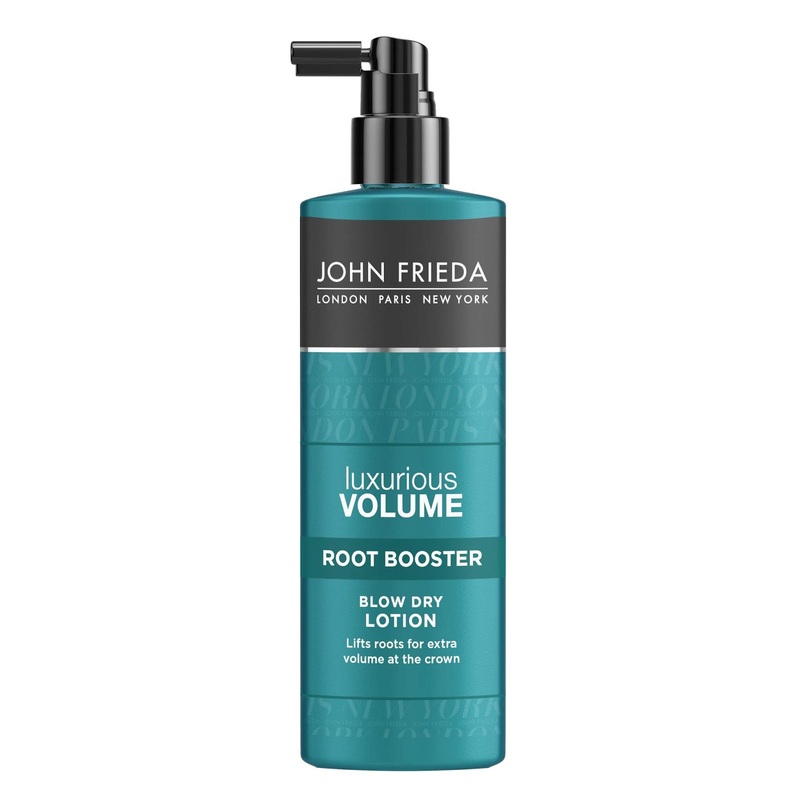 • Luxurious Volume Root Booster Blow Dry Lotion – Root Lifting Complex combines styling polymers and heat protection with a lightweight silicone that lifts, thickens and conditions. As the formula boosts hair from the roots and thickens strands, the formula protects hair from heat so you can safely heat-style while preventing hair damage. The formula is non-drying for soft, touchable style that lasts—no flaking, residue, stiffness or stickiness. • Luxurious Volume Thickening Mousse – This rich mousse creates unrivaled thickness by wrapping strands and boosting volume from root to tip for lush, soft hair. Thickening Technology with a specialized polymer blend increases hair diameter and lifts at the roots for weightless, non-sticky, all-day volume. The formula resists humidity for long-lasting sleekness and sheen. Panthenol helps strengthen hair, enabling hair to lift at the roots. • Luxurious Volume All-Day Hold Hairspray – This innovative, ultra-light formula creates body and volume with a boost of shine for high-impact styles that last all day. The salon-style formula contains a high-hold polymer to lock in style fast. All-Day Hold Hairspray is created with silicone to combat over-drying and provides humidity resistance to prevent styles from falling flat. Spray the product all over to thicken and hold style, or spot-apply for targeted lift. 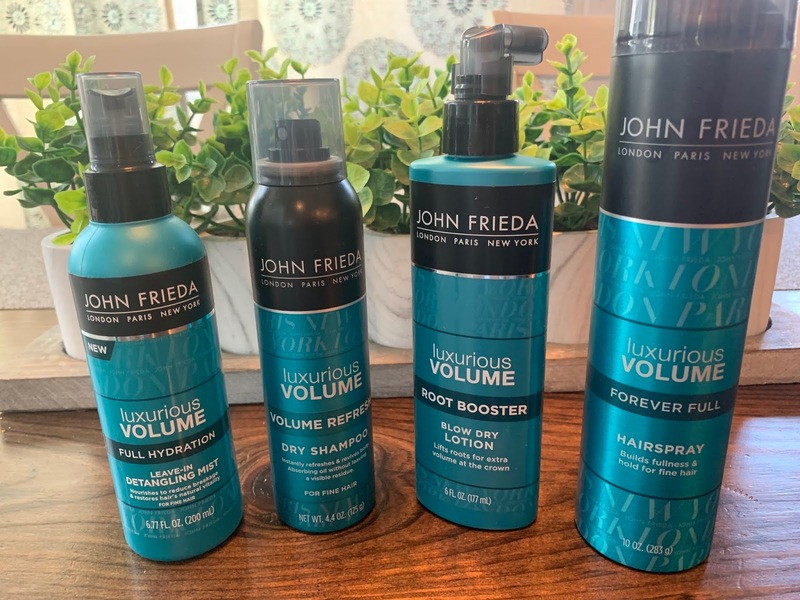 Have you used any products from the John Frieda Luxurious Volume line? I would love to hear your thoughts!